"Devices enormously smaller than before will remodel engineering, chemistry, medicine, and computer technology. How can we understand machines that are so small? Nanosystems covers it all: power and strength, friction and wear, thermal noise and quantum uncertainty. This is the book for starting the next century of engineering. "Devices enormously smaller than before will remodel engineering, chemistry, medicine, and computer technology. How can we understand machines that are so small? Nanosystems covers it all: power and strength, friction and wear, thermal noise and quantum uncertainty. This is the book for starting the next century of engineering." - Marvin Minsky MIT Science magazine calls Eric Drexler "Mr. Nanotechnology." For years, Drexler has stirred controversy by declaring that molecular nanotechnology will bring a sweeping technological revolution - delivering tremendous advances in miniaturization, materials, computers, and manufacturing of all kinds. Now, he's written a detailed, top-to-bottom analysis of molecular machinery - how to design it, how to analyze it, and how to build it. Nanosystems is the first scientifically detailed description of developments that will revolutionize most of the industrial processes and products currently in use. This groundbreaking work draws on physics and chemistry to establish basic concepts and analytical tools. The book then describes nanomechanical components, devices, and systems, including parallel computers able to execute 1020 instructions per second and desktop molecular manufacturing systems able to make such products. Via chemical and biochemical techniques, proximal probe instruments, and software for computer-aided molecular design, the book charts a path from present laboratory capabilities to advanced molecular manufacturing. 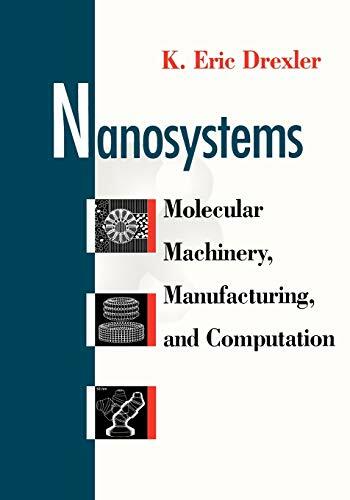 Bringing together physics, chemistry, mechanical engineering, and computer science, Nanosystems provides an indispensable introduction to the emerging field of molecular nanotechnology.